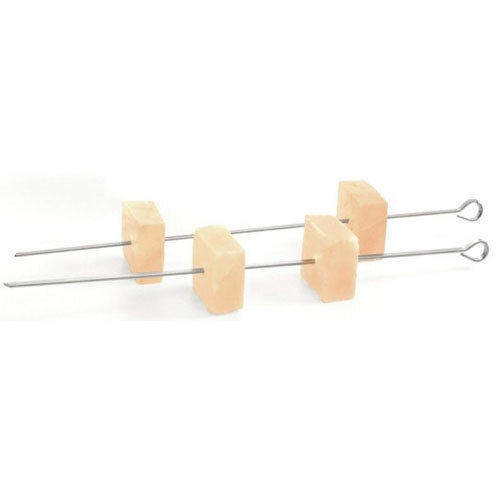 Himalayan Salt Cubes and Skewers Kabob Set | Patio and Hearth Co.
Cook your kabobs more quickly, more evenly, and with even more flavor! This skewer set with Himalayan salt cubes will help you grill your best kabobs yet. Thread these salt cubes onto your skewers along with your ingredients; the shape of the cubes will elevate your kabob off of the grill surface, promoting even cooking. Even better, as the salt cubes heat up, they act as conduits for heat and speed up the cooking process. All the while, the salt cubes transfer their rich, subtle salty flavor to the other ingredients on the skewer. It’s perfect for cooking moist and flavorful chicken, beef, or other meats. Inquire about Himalayan Salt Cubes and Skewers Kabob Set using the form below.